Intro: Why in Such a Hurry? Once again, there is an emotional eruption and political commotion in South Korea after the Japanese and Korean governments announced their diplomat “deal” on the Comfort Women on December 28, 2015.1 The official agreement includes a formal apology and a compensation of $8.3 million from the Japanese government.2 There is one important condition also included in the agreement; that this resolution should be “final and irreversible” this year onward.3 On the surface, the deal seems good—formal apology and some monetary compensation finalized. But then, why the emotional eruption and vehement opposition, especially from the Korean Comfort Women rights activists? In this regard, they point out at least three critical matters. In the agreement, first, there is no legal or moral responsibility taken by the Japanese government on its wartime crime, that is, sexual slavery. Saying “sorry” is not enough. Second, there should be no one-time “final” deal on the historical crime, but a continuing reflection and a gradual process of healing and reconciliation. Third, the agreement was completed too quickly, without consulting the Comfort Women themselves. The agreement seems like a cheap (or expensive?) deal to cover something up in a hurry—something unpleasant to both Korean and Japanese sides. What is worse, even a major number of Koreans tends to avoid a serious talk on the given matter.4 What exactly in the Comfort Women matter makes them, both Korea and Japan, so unpleasant? While in full acknowledgement of the significance of the first two critiques against the recent agreement, this article is an attempt to explore in detail the third critical matter that the activists point out. De facto, at the end the article will show that the third critique is a crucial contributing factor to the target of the first two. So again, what in the comfort women issue makes both the sides so unpleasant that the Korean and Japanese governments in such a hurry made a controversial deal? We will try to answer the given question in three aspects, namely, culturally, historically, and theologically. At the end, the essay makes a quick remark that the Comfort Women issue could be an invaluable rather than unpleasant one for both societies for the good reason of honest self-seeing. The issue of the Comfort Women is of grave cultural significance for both the Korean and Japanese societies far beyond government levels; that is, a culturally unpleasant one. For the given issue highlights chronic cultural diseases within both societies, which they will have to put into a long process of healing. To begin with, the overt avoidance and cover-up of the Comfort Women is nothing but a sheer reflection of the conventional Confucian patriarchal ideology deeply penetrating the two societies. Patriarchal ideology, needless to say, denigrates women to an inferior status as compared to men.5 The same ideology also perpetuates procreationism through male heirs as one of the highest individual and social values. Furthermore, the ideology cultivates the honor and shame culture which gives high honor to parents and the elderly, whether deceased or living.6 Now, the comfort women issue “violates” all these three cultural-ideological gems. The given matter not only discloses the “superior” men’s disgraceful wrongdoings, but also demands “undeserving” care and respect for women, most of whom, due to the severe sexual violence on their bodies, lost their chance for procreation. Besides, the talk on Comfort Women inevitably reveals the historical shame of their memorable male ancestors.7 This historical shame applies to both nations. Korean ancestors could not save their own nation from the colonial power, which eventually led to the awful tragedy of the Comfort Women. On the other side, Japanese ancestors, not to mention, were the real cause of that tragedy. This is certainly a traumatic shame in both cultures, so the following attitude seems inevitable, “Let the issue be buried forever. No more talks please!” What really makes worse this shared cultural trauma is the historical animosity and cultural ethos of superiority that the two nations developed against each other for centuries; something like “Our nation is always better than you (in every aspect).” Hence, the talk or any talk on the Comfort Women is a hateful scar on each proud nation’s cultural consciousness. In sum, any serious discussion on the Comfort Women is a huge shameful self-disclosure of both societies which probably they are still too immature to deal with. However, immaturity cannot and should not be any excuse for the blatant avoidance. Rather, full honest self-disclosure of their unjustifiable shames, as common psychological wisdom goes, may lead to great maturity of both cultures in the coming years. Behind the hasty denial of the history of the Comfort Women, as we have seen above, there is the deep feeling of shame for both nations. Underneath this instant and emotional reaction, meanwhile, there lies a cold political and historical calculation as well. On the one hand, those who wish to end the talk on the Comfort Women—Abe Shinzo and his Japanese government, Geun-Hye Park and her Korean government, and the third power (i.e., the U.S.) that instigated the resolution between the two—have their hidden rationale in their own historical, political, and international perspectives. 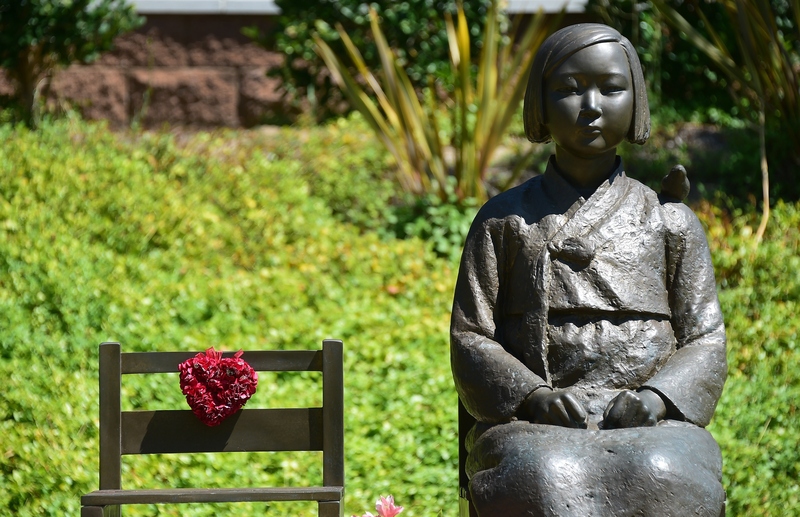 Internationally, the issue of the Comfort Women functions as a catalyst to break down, rather than build up, the trust relationship between Japan and Korea. Politically, this unstable and hostile relationship between the two and the accusation against the Japanese military threatens the United States’ plan “for security cooperation” against “the threat posed by North Korea’s nuclear and missile programs.”8 Historically, Abe wants to erase Japan’s history of being a war criminal during the Second World War. Since the Comfort Women are one of the most horrific war crimes and a massive violation of human rights, Abe and his government have tried to cover up and move on from that critical issue in any and all possible ways, hopefully with no blemish left on their part. The veiling of their shameful past as a victimizer, however, seems hypocritical, when we think of the Japanese government’s previous effort to unveil the U.S. government’s injustice done through the internment of Japanese Americans during the same war. Last, but not least, the ongoing talk on the Comfort Women and the demand for a formal and sincere apology from the Japanese government has been a stumbling block for a recent rightwing political agenda of Park’s government. The government now wants to neutralize the controversial memory of the pro-Japanese collaboration during the Japanese colonial era by publishing the government-censored Korean history textbook.9 Once published, this textbook will be the only textbook that will be used in all high schools in Korea. Given the historical and political reason above, for some (or many?) from both nations the Comfort Women issue should be buried soon. In the parable, Jesus identifies himself as one of the very least of the world—naked, sick, poor, oppressed, and imprisoned. Jesus is the one whom the world despises and even kills. In both Korean and Japanese societies, the Comfort Women appear to be the very least of the least. Once they were naked literally, strangers in the unknown land, thirsty in the battle grounds, and died in the prison-like sick bed. Further, once they returned to the ever-desired homeland years later, they found (and still find) themselves as despicable social taboos, only cared for and looked after by an invisible few in society. They are still mentally naked, strangers in their own communities, thirsty for justice, and dying in the sick bed with no family or relative around them. Jesus simply said, “I’m among them.” Or more bluntly, “I’m one of them.” Thus, it is obvious that when we turn our backs again on the Comfort Women, we are not only despising our own fellow citizens, lonely and sick, but rejecting Jesus in his human flesh and blood as the Fourth Evangelist sadly predicted (John 1:10-11). The Comfort Women still continue their weekly Wednesday Protest at the Japanese Embassy with their prophetic voices of justice, care, love and peace. We Christians need to listen to their message; however their existence and message make us feel unpleasant. Then, we may have a good chance to meet Jesus, perhaps for the first time in life, living and eating among the Comfort Women.